Phragmipedium besseae is a beautiful red Phragmipedium orchid (f. flavum is a yellow form of the species) with excellent color and shape. If I could have just one orchid, it would probably be this one. 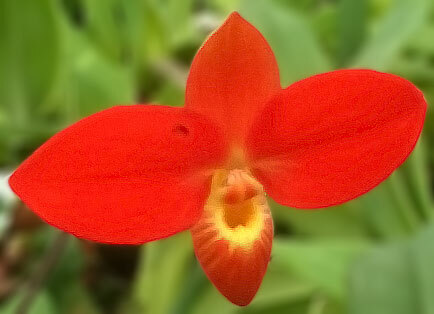 The species is widely used in hybridizing, and is in the parentage of most popular Phrag. hybrids, including Phrag. Don Wimber, Phrag. Jason Fischer, and many others. Its bright red color is actually carried on a fuzzy layer above the tepals; the yellow flavum form lacks the red pigment so that the underlying color shows through. Interest in Phragmipediums was minimal before this species was discovered in 1981. (They come from Ecuador and Peru.) But discovery of such a brightly-colored, showy flower led to a significant increase people growing Phrags. At the time, few orchidists new how to grow these plants, and most grew them like Paphiopedilums so that they didn't have enough light or water. The foliage is attractive too; it looks a lot like a daylily. Sometimes there will be long rhizomes that grow over the edge of the pot; just bend them back into the pot before roots start to grow, or move to a larger pot. In nature, these plants grow in rainforest environments next to mountain streams. They like pure water and a LOT of it. You'll get the best results if you have a reverse osmosis system filtering your water. It's impossible to overwater these plants unless you put them completely underwater so that the leaves can't breathe. Many people set them in a dish of water. (A tray of moving water with an aquarium pump may be better; try putting them with the Disas.) I suggest watering at least daily. Put them in a potting mix that retains a fair amount of moisture, such as sphagnum moss or rockwool. Fine fir bark can work well too. Though they grow on the ground next to streams in nature, I don't suggest a typical terrestrial orchid potting mix, as they tend to be lithophytes growing in moss, leaf litter, and so forth, which more closely resembles how an epiphytic orchid would grow. They can bloom at any time of year, though they bloom most in spring or when temperatures are cool. Flowers will appear one at a time, appearing sequentially on the flower stem and lasting a couple weeks each. An inflorescence can last 3 or more months on a happy plant. (Larger specimens may stay in bloom continuously.) Temperatures should be intermediate, 70-80°F (21-27C), dropping 10-15°F (6-8C) at night. Provide high humidity, about 70%. Use some fans since they like a breeze; otherwise you'll get various sorts of rot and other diseases showing up. (If you see a leaf rotting, remove it immediately and swab nearby parts of the plant with isopropyl alcohol to sterilize the plant's surfaces.) Light should be intermediate, about 2000 footcandles. They can do OK with Phalaenopsis lighting, about 1000 footcandles, but it's a bit low. If you live in the northern hemisphere, I suggest a slightly-shaded south window or a bright east window.